Summer hasn’t ended for me, not just yet. In a few days I am heading to Lanzarote and I seriously can’t wait! Such a beautiful hotel we are going to stay and I am so looking forward to it. But this summer I have fallen in love with two products that have helped me a lot and made me feel like a bronzed, golden goddess. I did go back home for (almost) three weeks and got myself a beautiful natural tan but in between that, I discovered a lovely new fake tan from L’oréal Paris. 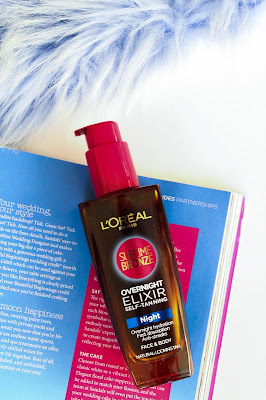 Yes, we are going to talk about L’oréal again and I am not sorry at all. I am not an expert in fake tanning and so I always look for a good product with an easy application. I hate when I try on a new fake tanning product and they either dry to fast making the application much more difficult or the color is a bit off. When I fake tan, I want to have a natural tan as if I just came back from holiday and the L’oréal Paris Sublime Bronze Over Night Exilir Self-Tanning gives me that. I bought this product because Victoria from Inthefrow mentioned it so many times and I do trust her reviews and so I decided to give it a try and I am in love. The one thing I love about this product is that it is extremely hydrating to the skin. The thing I don’t like is the smell that it leaves on your skin and bed sheets so bare in mind that you will probably have to do some washing when you use this fake tan. Apply it either with your hands or a mitt, leave it acting overnight and you will wake up with a natural-looking-tan that will last at least one week and a half (personal experience). I do apply mine with a mitt because I am a bit fussy when it comes to applying fake tan with my hands and it works wonderfully. It doesn’t dry to quickly so it gives you time to spread it evenly through your skin and it doesn’t leave any streaks or dry patches. But remember to exfoliate your skin before application (read more tanning tips here). I have also tried applying two layers for a darker result and it did work quite well. Make sure you let the first layer dry properly and you are good to apply a second one. Again, the smell is a bit annoying but it comes off as soon as you wash it off the next morning. It also works great on your face and that is a massive thumbs up for me. I hate when I can’t fake tan my face and then I go to the beach, take some pictures and have my face looking as white as it can be and my body perfectly tanned. With this product, that doesn’t happen. I use a brush to apply the fake tan on my face and I wake up next morning with a golden skin. Now the bronzer, that’s my second love. I don’t think I ever had this many people asking “what do you have on your cheeks? It looks beautiful!”. 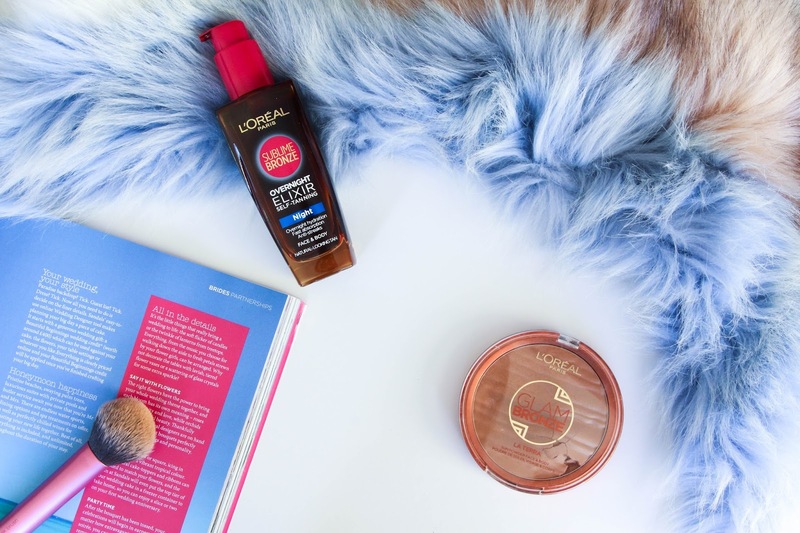 And all because of the L’oréal Paris Glam Bronze La Terra. I bought it as an impulse as I never actually read any reviews on it. 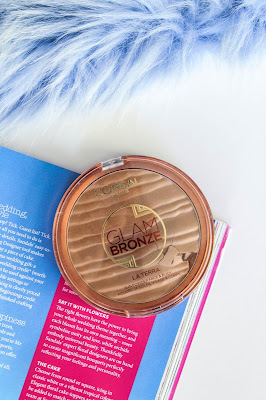 I just saw it and thought that it was such a big bronzer and the colour was so pretty that I had to give it a go. The packaging is quite nice but nothing too extravagant. What surprises me is definitely the size of this bronzer. I am sure it will take me a while to hit pan and believe me when I say that since I bought it, there hasn’t been a day where I do my makeup and not apply this product. I always put a bit of this bronzer on even if I want to contour my face. It applies like butter, blending into your skin and looking very natural. It give you a nice, bronzed, golden look that you will love (at least I do!). The only down side is that at least in store, I have only found one shade available and I am lucky that it works for me. I have looked online and I don’t seem to find any other which I feel like it is a big fail by L’oréal. If you are lucky and suit this shade, give it a go as you might really like it. The combination of these two products along with some highlight on the right points of your face/body will give you a beautiful golden, bronzed goddess like glow that you will fall in love with. Have you ever tried any of these products? Or do you recommend any bronzer/fake tan that I do need to try? Let me know! Next Post My Blogging Routine – Including FREE Blogging Planner Spreadsheet!